To produce high grade household/living paper roll, paper plants can rely on advanced paper manufacturing solutions from Leizhan. Leizhan supply high technology paper pulping equipments for household/living paper pulp making systems. Leizhan advanced technologies in pulping, cleaning, screening, refining, and mixing can be tailored to specific raw material, final sheet grade requirements and mill conditions. Leizhan supplied tailored solutions for Household/living paper stock preparation system for paper mill: Pulping( drum pulper, D type hydrapulper, etc. ), Cleaning(high density cleaner and low density cleaner), Screening(mid consistency pressure screen, inflow pressure screen, vibrating screen, etc. 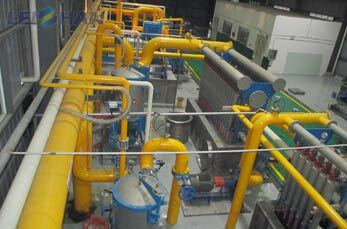 ), deinking(flotation deinking machine), and so on.